It’s a beautiful story of a young shepherd boy who travels the world looking for a worldly treasure that was promised him. During his travels, he meets all sorts of interesting people, makes a lot of money, loses it, makes some more and seemingly endures one hurdle after another. That is, until his grandest dreams come true. The Alchemist has my name and story written all over it. I herd sheep and my name is Alchemist. I'm Patrick, a dude living in a School Bus. On March 4, 2015 the idea of “SkoolieLove” was born. 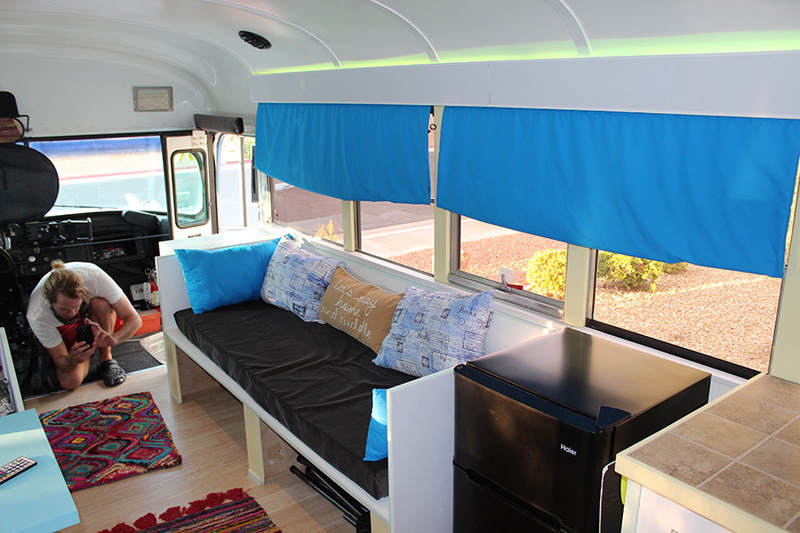 A Skoolie is a converted school bus, which I would ride around spreading awareness and Love. Social Media accounts were created, and everything was setup for me to become a famous Bus driver. I set off on my EPIC 10,000 mile road trip across this great country on August 15 of that year. I lived as much as I could, enjoying myself tremendously, taking notes and as many pictures as I could. 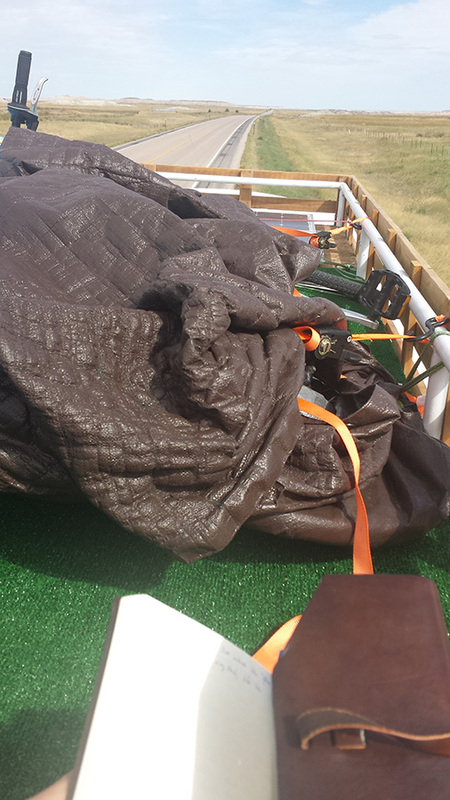 Building my Tiny Home on Wheels, and the ensuing adventure was a success! A few days into December of 2015, I posted a “Bus Road Trip” picture album on the site IMGUR, which went completely nuts! I posted it and soon had 10 views. 30 views. 250 views. 1,000 views. 5,000 views! It went viral. You can see it HERE Now up to over 250,500 views! I stuffed my face into a pillow on the couch to calm my breathing. This was so amazing! I was so excited. It was the first nod to me, that people appreciate the way I live. They were approving of my choices and wrote some tremendously positive comments. It’s nice to know when other people agree with my life choices and accept me for them. The next morning, I saw that my email inbox had blown up. There were requests for interviews! I couldn’t believe it! I got in touch with as many people as I could to get the word out about down shifting and living in a bus. Over the next couple days, I talked with ABC Travel news, Mirror, DailyMail, and other outlets that were covering the Big Blue Bus story. Once the articles came out, it was so super awesome to see my life’s story, Bus Life, written out like that. To be mentioned because I chose to live in a bus, after posting an album on a picture website! When I started, all I wanted to do was live in a Bus, and do nothing except the things I loved. Less dishes, less cleaning, and NO job to go to. Reading when I want to read, seeing what I want to see, doing exactly what I want to do. I wanted there to be nothing that I HAD to do. I wanted MY time to be MY time. That was my goal when I bought the bus. Was is possible? I HAD to find out. A couple weeks after the interviews came out, I received an e-mail from a Home Show director in New Jersey. Turned out, he heard of the Bus and loved my story, inviting me to come attend the show. He would even pay me for doing so! I was beyond excited. What a wonderful opportunity, to have my Tiny Home FEATURED at an event! I called my dad, and teared up on the phone, my leg shaking. We built this bus together. We had such growth in our relationship because of the build. Here, it was being acknowledged. It was beautiful. The show went amazingly well. In July of 2017, I had gotten an email from a production company in England. They were sending a production team over to the States and wanted to shoot an on-the-road documentary about Marijuana Legalization. 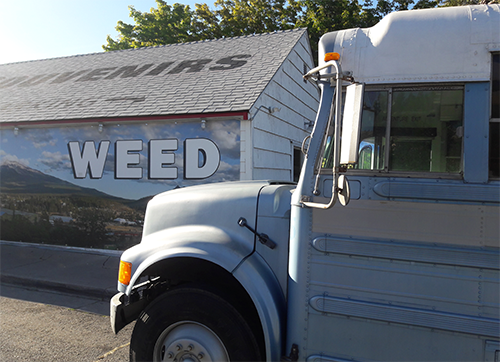 They contacted me wondering if I would be willing to rent them the bus. Long story short, AWESOME OPPORTUNITY, not great timing. Did not work out. These are the possibilities! I never imagined these would be the calls and e-mails I’d be answering. Bus Life has been the right decision, through and through. If you received one e-mail today, which could dramatically improve and change your life, what would it be? What are you currently trying to accomplish? Achieve? Acquire? What do you need to happen in life for you to feel more fulfilled? What passions are you pursuing? What makes you get up in the morning? What do you wish you would do? What are you excited about, waiting for? Step out of your current life’s “limitations” and think about you would do if everything was possible. Imagine how you would feel if you get what you are working to attract? I wished that I could simply live in a bus, so I set out to convert a bus into a Tiny Home, and worked to make that my reality. I was tired of paying rent, exhausted from long hours working a job that wasn’t right for me, and driving too long and often to get there. I had money, but was always short on time. I wanted to reclaim my time, even if it meant I would have less money. 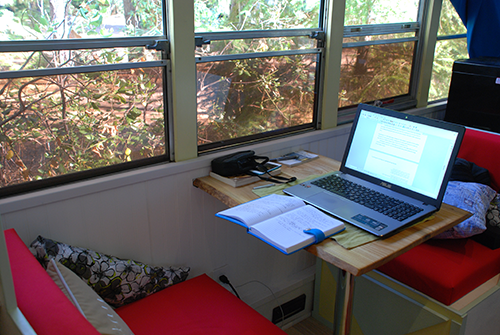 Working as a digital nomad, freelancing could provide me with more time AND more money. My main objective back then was to live in a place that I felt comfortable in. A place where I could put up anything on the walls, paint it however I liked, and make it feels as homey as possible. I wanted to live in a bus and came away with a whole new outlook on life, realizing each moment is filled with endless opportunities. Put your intentions out there; you never know how far they will reverberate and come back to you ten fold. Putting a number on it, I would say life has become 99.98% more interesting since I bought a church bus to live in. It’s a different kind of buzz. It has been a balance of physical day labor, as well as mental, creative labor; in the form of writing, building websites, e-commerce, social media and photo editing/graphic design. Creating a structured story out of thin air is one of my favorite passions. I am literally exchanging free ideas and words for money. I spend most of my time reading, writing, and researching. When I first came up with the “SkoolieLove” idea in March of 2015, creating social media accounts and trying to find other bus people, I came across “Bus Life Adventure” on Instagram. I was BLOWN AWAY that Brock was living out of a white shorty bus, hitting the slopes wherever he and his friends could find snow. Episode one features buying a short 4x4 school bus in NY and road tripping it back to UT where Brock Butterfield and friends converted it into a bus conversion Tiny Home and chopped the back four feet off, moved it in and welded onto the four feet of frame left to create a snowmobile deck. So the other day, while sitting in the dining room chair of my Bus home, I was working on a story about a time traveling bus, when my phone lit up. I turned on the screen and saw I had gotten an e-mail from Brock, the Bus Life Multi millionaire-Extra-extraordinaire. (He’s probably more of a thousandaire, but his personality and style is AWESOME!) He was my best friend from the first night we met. It has been so amazing following their popularity rise over the years. It was especially amazing to meet Brock in person, years after “meeting” him and his bus Bruce online. He has been my best friend since the first day we met, his personality is that positively infectious. As mentioned on the phone I’d like to hire some of my select friends who enjoy writing. You, obviously are one of my first choices and I may even have more for you to do and make a couple bucks if you’re up for it. 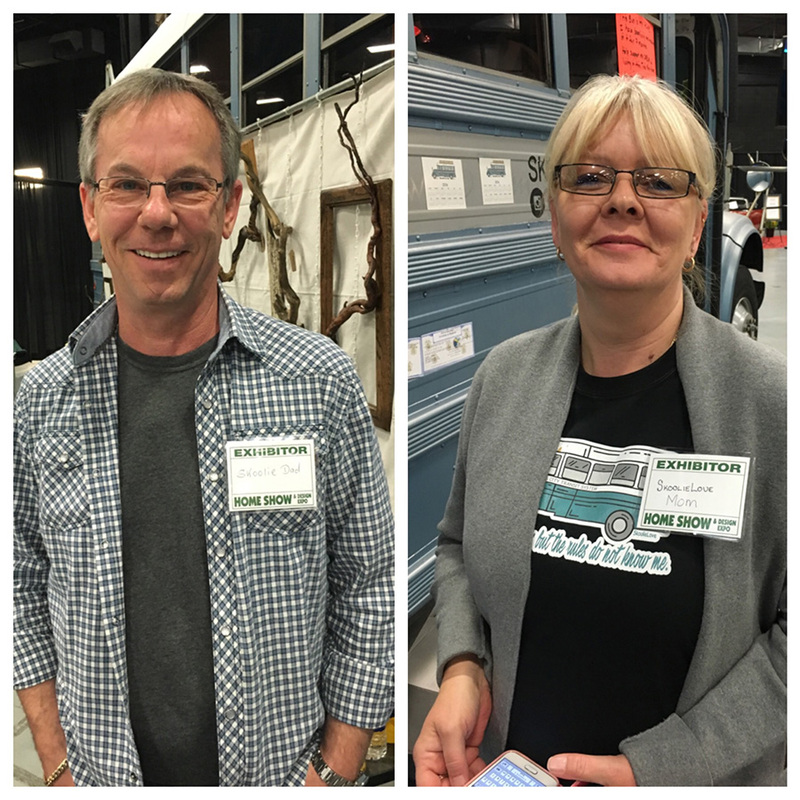 I met Brock and his fiancee Heidi in person in September of 2017, at the Tiny House Living Festival near Portland, Oregon. 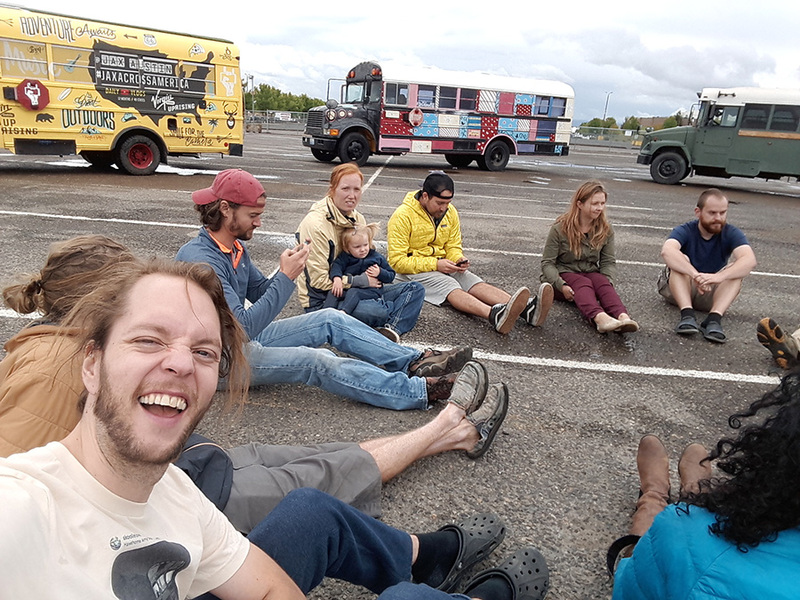 There is an immediate connection and bond among the Bus and Van Lifers, sharing so many of the same experiences living in a small home on wheels, traveling across the country. We instantly felt like we had been close friends forever, and he did not hesitate to invite me into their Bus Home for a glass of whiskey. Bus Life is the Good Life. Then we talked about engine troubles, how we built our interior walls, where we poop and shower, what we eat and how we cook it – you know - typical Bus Life stuff. The e-mail I was looking at on my phone was from Brock, tossing around the idea for a “Contributing Writer” and social media assistant he was looking to hire. He knows I love writing, and asked me to start putting some articles together for the site. The journey continues! Another e-mail has found me alive and well. 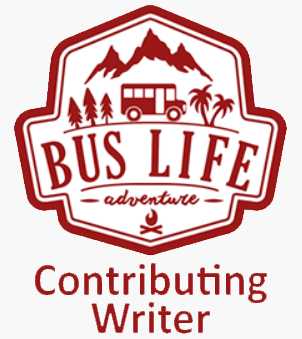 Meet the newest Contributing Writer for BusLifeAdventure! So here we are today! 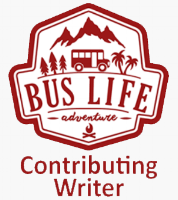 I am now a content creator and guest blogger for Bus Life Adventure under "SkoolieLove Bus". I will be cross-posting here and there. Through my writing, I hope to get more in touch with the Bus Life/Vanlife/ community. Sharing positive knowledge, and growing the network of information- That’s what Bus Life Adventure and SkoolieLove are all about. We don't have a product to sell, as much as we are promoting a way of life. Every moment is a new opportunity. The next moment could be The Grand Opportunity.